Some makers will prefer to "build up" the back from three (or more) thin veneers. If this is done the two outer layers should both be "matched" for grain. It should be mentioned that it has been proved that a better tone is imparted to the finished instrument by using a solid piece of timber cut as described above. A cabinet scraper is the best tool to use for working the solid wood down to the re�quired thickness (or should one say "thin�ness"?). 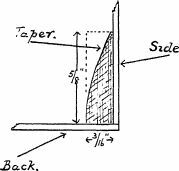 A scraper blade need only be a piece of hard steel, about 1/16" thick, with the scraping surface whetted perfectly square on a fine oilstone. The other edge of the scraper can be sharpened like the cutting edge of a plane for rough scraping. Fig. 11.�Details of the bottom lining, showing how it is tapered off after fitting. When you are sure that both the top and bottom linings are satisfactory, and well glued into position, the next step is to see that top and bottom surfaces of both the top and bottom blocks are perfectly level with the sides of the guitar. Now go carefully over the work com�pleted so far and remove any surplus glue with a small chisel, taking the greatest care not to cut into any wood. It is very impor�tant that a perfectly smooth finish be achieved on all inside work. Smooth sur�faces will not collect dust � accumulated dust inside a guitar can harbour damp which will be detrimental to both instrument and the tone it produces. The next part of the instrument to be made is the back. For this you need two pieces of wood the same material as the sides and these should be 20" long by about 7J" wide and \" thick. When purchasing this timber the guitar maker can select a suitable piece of wood the size he requires but at least 1/8" more than twice the thickness needed. (This \" is to allow for the wastage in cutting the timber into two pieces.) The timber mer�chant will cut the piece of timber down the thickness on the circular saw and, when it is " opened out," the grain in each half will match. 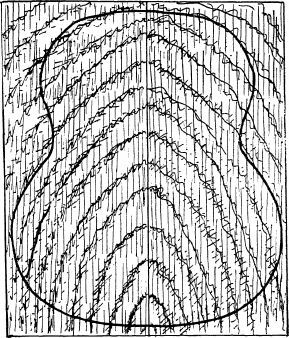 the mould as a template.